This is a commercial movie made for the masses. It shows excellent timing between Rajesh Khanna and Tina Munim. The movie has nothing new to offer but has the ability to hold and entertain the audiences. 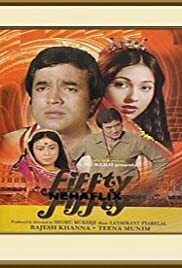 The production values are average and the music by Laxmikant Pyarelal is good in places and poor in places.Fifty Fifty revolves around the two central characters Rajesh Khanna and Tina Munim. But the overall presentation is a little loud and the actors at times tend to over act and be loud. It is a good entertainer and people can see to pass their time as the plot has nothing new but the acting of Rajesh Khanna the superstar pulls the movie along. In the end it can be summed as a commercial movie of Rajesh Khanna made in the 1980s.